Ringo Starr's third studio album was released in 1973 on Apple Records. Starr's first two albums, Sentimental Journey and Beaucoups Of Blues, were both released in 1970. Although he scored subsequent hit singles with It Don't Come Easy and Back Off Boogaloo, he chose to focus on acting. However, in 1973 he returned to music, enlisting producer Richard Perry and a range of guest composers and performers. Ringo is most notable for featuring all four former Beatles, although not all on any single song. John Lennon, George Harrison and Starr featured on the Lennon-penned song I'm The Greatest. Harrison co-wrote and performed on three other songs, while Paul McCartney wrote and performed on Six O'Clock and played kazoo on You're Sixteen. The bulk of the album was recorded from 5 March to 30 April 1973, with overdubbing continuing up to the end of July. From 5 to 27 March sessions took place at Sunset Sound in Los Angeles. On 13 March the song I'm The Greatest was recorded in 10 takes, with Starr, Lennon and Harrison all present. On bass guitar was Klaus Voormann. The session prompted global news reports that The Beatles had reunited with Voormann replacing McCartney. Work on Ringo continued at Burbank Studios, Sound Labs and Producers Workshop in LA. On 16 April, at Apple Studios in Savile Row, London, Paul and Linda McCartney joined Starr to record 15 takes of the song Six O'Clock. During the same session Starr recorded a tap dancing sequence for Step Lightly, credited on the album to Richard Starkey, MBE. Ringo was released on 2 November 1973 in the United States, and 21 days later in the United Kingdom. In America the single Photograph was released ahead of the album, on 24 September. The b-side was Down And Out. The single was released in the UK on 19 October, several weeks after the album. A promotional clip was made at Starr's Tittenhurst Park home, although it was shown just once on the BBC television show Top Of The Pops. The album topped the charts in Canada, Spain and Sweden, and was a top 10 hit in Australia, the Netherlands, Italy, Norway, Japan, the US and UK. It was kept off the top spot on the main US Billboard 200 by Elton John's Goodbye Yellow Brick Road, although it topped the Cashbox and Record World charts. First editions had the second track, Have You Seen My Baby, incorrectly listed as Hold On. The initial run of cassette tape and 8-track editions of the album featured a longer version of Six O'Clock, which was also on some promotional vinyl copies. The label of initial copies of the regular vinyl edition listed the running time for the song as 5:26 rather than the correct 4:06. The longer version was included on the 1992 compact disc version of Goodnight Vienna. 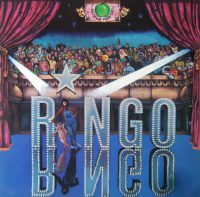 The Ringo album was deleted in the UK in 1978, but was reissued by EMI's budget label Music For Pleasure in November 1980. It was packaged in a non-gatefold sleeve, the apple and motto were removed from the front cover, and the back cover contained the song credits. On 4 March 1991 the album was released in the UK by Parlophone on compact disc with three bonus tracks: Down And Out (b-side of Photograph), It Don't Come Easy (1971 single) and Early 1970 (b-side of It Don't Come Easy). The US release date by Capitol was 6 May. The CD versions featured a crossfade from Devil Woman to You And Me (Babe). The second single from Ringo was You're Sixteen, backed with Devil Woman. It was released in the US on 3 December 1973, and 8 February 1974 in the UK. A third single, Oh My My, was released in the US only on 18 February 1974. Following the commercial success of the singles, John Lennon sent Starr a telegram saying: "Congratulations. How dare you? And please write me a hit song." An instrumental version of Ringo, titled Sta*rtling Music, was produced by David Hentschel and released in the UK on 18 April 1975. It was the first release on Starr's label Ringo O'. The instrumental album was eventually given a US release on 17 February 1979. I doubt it sound beatles because if you listen to the bass part of the greatest its very basic in form. Paul’s melodic bass lines could have changed the sound from plain to something more. Klaus Voorman was and is a fine bassist. He is. But Paul is the greatest. Indeed Robert and yet there are only two comments on this. Lennon’s album featired Starr and Voorman as well so this is not the on;y album that sounds like a Beatles album. Does anyone have an idea who sings high harmony with Ringo throughout Photograph? Could it be Nilsson?